Purushoth Arun attended Become a Ninja in Web Designing in just 8 hours! "His way of teaching & handling the students is very good. " Abdul Razak.m attended Become a Ninja in Web Designing in just 8 hours! "He is a good tutor. I highly recommend him. " 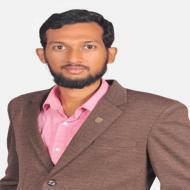 Syed Abu Dahir attended Become a Ninja in Web Designing in just 8 hours! "The class was super we can learn it everything about workshop.Overall it was good :) "
Bakshi G. describes himself as Computer Enthusiast & Passionate Teacher. He conducts classes in Web Designing. Bakshi is located in Kandancavadi, Chennai. Bakshi takes Regular Classes- at his Home. Bakshi has completed Bachelor of Engineering (B.E.) from B.S.Abdur Rahman Crescent Engineering College in 2012. He is well versed in English and Tamil. Bakshi has got 3 reviews till now with 100% positive feedback.